What's the weight of snow on a roof? Should I shovel my roof today? How to remove snow from your roof? Unless you're lucky to live in sunny California, you probably know the never-ending plight of shoveling heaps of snow from your roof every winter. And while not everyone has experienced Alaskan snowfalls such as the record-breaking 78" in 24 hours in 1963, we all know that a sudden blizzard may leave your house covered in a thick layer of snow. Until now, you probably shoveled your roof irregularly, or when it seemed about right. Still, you might have wondered whether it was safe not to remove the snow immediately after a snowfall. Our snow load calculator helps you to make the decision when to remove the snow from your roof by comparing the weight of snow with the load-carrying capacity of the roof. Please remember that the numbers given by this calculator are just an approximation and are by no means 100% accurate. You should always remove ice buildup and pay attention to the signs of stress on your roof. When in doubt, it's better to shovel in advance! Length and width of your roof. You can enter these values in any units you'd like, including meters and feet. If your roof is pitched, enter the length and width of the flat area covered by the roof. Roof pitch. You can enter this value either as a ratio x:12 or as an angle, whichever suits you better. Snow cover thickness. Intuitively, this is the number of inches of snow on your roof in the place where the cover is the thickest. Snow type. The density of snow depends on whether it's fresh, wet, wind-packed, or mixed with ice. If you're not sure which type to choose, always settle for the wetter types, as they are denser. The result - snow load, or the pressure exerted by the snow - has the units of kN/m² or lbs/ft². The weight of snow is measured in kg or lbs. The density of snow, and hence its load per square foot, depends on the type of snow. For example, fresh snow is soft, fluffy, and light. On the other hand, snow that stayed on your roof for a few days will settle and, while it seems that the cover gets thinner, its weight doesn't change - it's just the density that is different. The most extreme case is observable in the case of ice. Ice buildup on your roof is hazardous and should be removed immediately. As you can see in the table below, its density is over 15 times higher than the density of fresh snow! 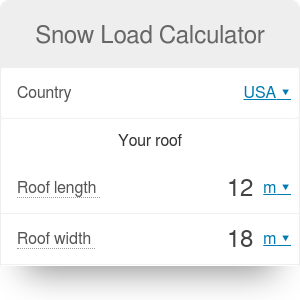 If you live in the US, our snow load calculator compares the total weight on your roof with the permissible load calculated according to the standards issued by the American Society of Civil Engineers regarding the Minimum Design Loads for Buildings and Other Structures (ASCE7-16). These standards were first published in 1988, and while they are updated from time to time, the calculation process essentially stays the same. It means that if your house was constructed before 1988, it might not comply with these regulations - in such a case, make sure to take the results from this calculators with a large pinch of salt! The maximum weight of snow allowable on your roof depends mostly on the location of your house. If you recently moved from California to Ohio, you need to build the house differently, unless you want to spend half of your life on the roof, shoveling. Our calculator allows you to choose the state you live in, and - in the case of Alaskan locations - the specific city. All the information is taken directly from the ATC Hazards website. Terrain type. 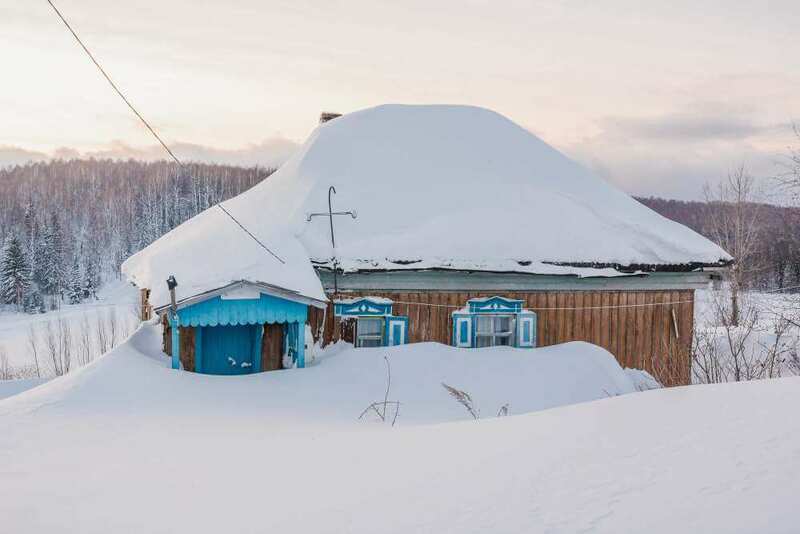 As you might expect, the roof a building placed in a windswept, mountainous area will accumulate a different quantity of snow as a house in the middle of a city. Roof exposure. 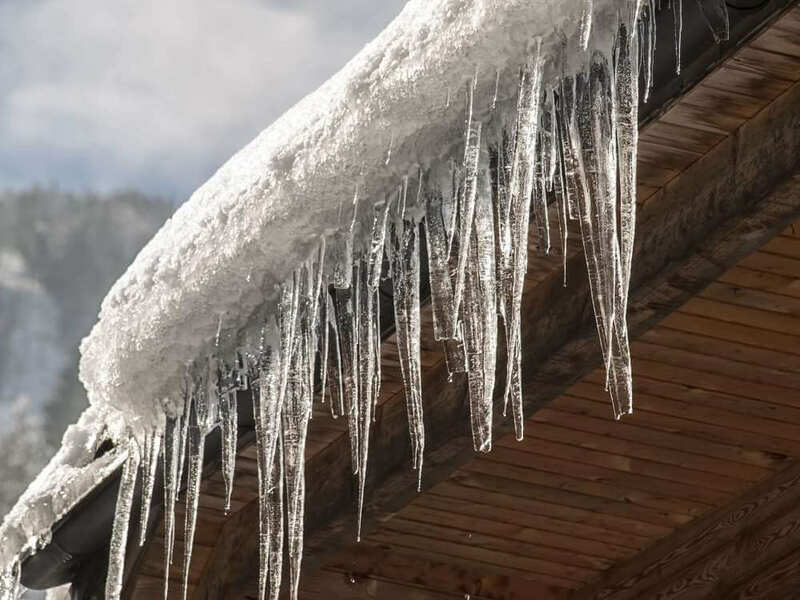 If your roof is partially blocked by obstructions, such as trees or higher structures surrounding your house, less snow will accumulate on it. Temperature in the building. Buildings kept at low temperature, such as agricultural buildings, or heated greenhouses will have a different roof temperature than a regular detached house. This influences the process of melting and, consequently, the quantity of snow on the roof. Building importance. As you might expect, buildings of high importance, such as power plants, schools or hospitals need to be more snow-resistant, and so can withstand a higher load. Since Canada frequently experiences heavy snowfalls, it's essential to know how much snow load your roof can withstand. Our calculator automatically finds the permissible load on your roof according to The National Building Code of Canada (NBC). Remember, though, that each province has adopted the NBC document with minor tweaks and adjustments to account for the specifics of the region, so the real value might differ slightly from the one provided by our snow load calculator. The maximum weight of snow allowable on your roof depends mostly on the location of your house. In our calculator, you can choose the exact location by firstly selecting the province or territory you live in, and then specifying the city. 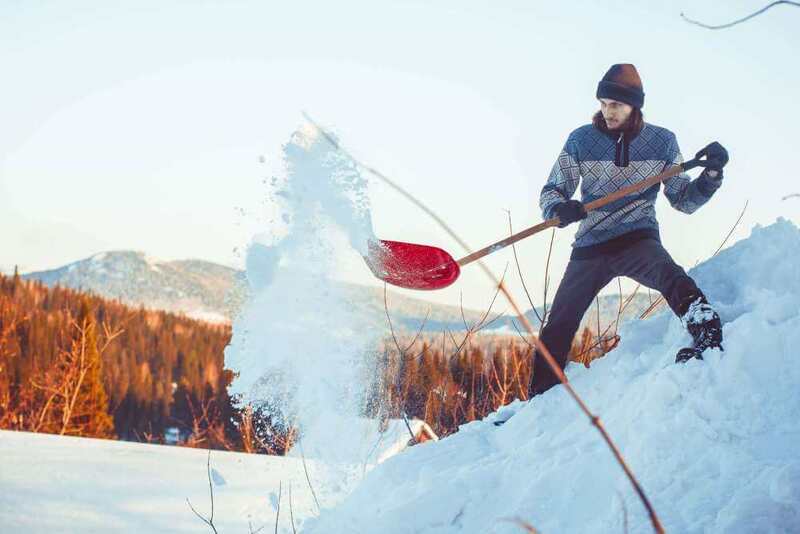 The National Building Code of Canada instructs to treat the 1-in-50-year ground snow load as a characteristic value of the permissible snow load. Roof exposure. If your roof is located in windswept areas (or even north of the treeline), the wind will cause snow drifting, making less of it accumulate on your roof. Slipperiness of the roof. Less snow will accumulate on a slippery roof - it will slide off instead. Basing on the roof parameters you specified in the first section, our snow load calculator displays the maximum allowable snow cover thickness and snow weight. It also informs you whether you should immediately remove some of the snow, or you can wait a little bit longer. Make sure to not wait for too long, though! Even if our calculator claims that the current snow cover isn't dangerous for the structure, a sudden snowfall at night can change the situation dramatically. It's always better to be on the safe side! Convenience. While most obvious, this factor probably rings true for everyone. Who would have the energy to spend each morning meticulously shoveling the snow off the roof? And, more importantly, where should you store all of it? Insulation. A layer of snow insulates your house from above, preventing the heat from escaping and thus significantly lowering your electricity bill. Damage prevention. If you're shoveling a tad too much, you can damage the roofing tiles. This, in turn, leads to leakage and moisture buildup in the roof structure - two phenomena that should be avoided by all means. Regardless of the recommendations of this snow load calculator, there are some cases in which you should always remove the snow from your roof. In these situations, make sure to act quickly - any delay may be potentially dangerous for both the structure and the residents! Icicles or ice buildup. When temperatures change over the course of the day, it might happen than the snow will melt and refreeze, forming an ice layer on the roof. As you already know, ice has a substantial density and causes a lot of stress on the structure. Additionally, icicles hanging over your head are dangerous for passerbys - they might fall on somebody's head! If ice forms on your roof, remove it immediately. Visible signs of overstressing. If your house has been snowed under, the weight of the accumulated snow may cause the structure to show signs of overstressing. These include sagging ceiling tiles, noises such as creaking or popping, cracking walls or leakage (damp spots on your ceiling). If the roof seems damaged, don't attempt to clean it, as it might collapse - instead, contact a structural engineer to assess the scope of the problem. Never stay inside an unsafe structure! Solar panels. A snow layer covering solar panels is not dangerous, but it prevents them from working properly, as sunlight cannot reach them. If you have solar panels installed on your roof, remove all snow from their surface to make sure they keep functioning efficiently. If you're from Alaska or Maine, you probably know this process inside and out. Nevertheless, you should remember that the deceptively simple act of shoveling snow off the roof might be dangerous, both for you and pedestrians walking by. First of all, make sure to stay safe while removing snow. Secure your ladder to make sure it doesn't move and step carefully to ensure you don't slide off the roof. Secondly, as mentioned before, leave a thin layer of snow - if you don't, you might damage the tiles and cause leaks through the roofing. You should also consider where to put all the snow from your roof. If you just push it over the edge, be very careful that it doesn't land on people passing by or on cars, as the effect is similar to a small avalanche! When removing ice from the edge of your roof, shovels or hammers won't prove overly useful. Instead, you can try using chemical de-icers; make sure they don't contain salt, though! Rock salt may damage your roofing tiles and corrode metal elements such as gutters or nails. Snow Load Calculator can be embedded on your website to enrich the content you wrote and make it easier for your visitors to understand your message.